Sweet potatoes have enormous health benefits. Many studies have suggested that increasing consumption of sweet potatoes decreases the risk of obesity, diabetes and heart disease. Sweet potatoes have a low glycemic index scale. Quinoa cooking and benefits can be seen here. So, instead of the usual potatoes for a sandwich, I made this healthy sweet potato and quinoa filling. More quinoa recipes can be seen here. Chilli powder - 1/2 tsp. Pepper powder - 1/2 tsp. Chat masala - 1/2 tsp. Lemon juice - 3 tsp. Cook quinoa as per instructions given in the pack. Spread a generous coating of melted ghee on one side of all bread slices. Keep ready. Combine cooked quinoa, mashed sweet potato, salt, chilli powder, pepper powder, lime juice and mix well. Add finely chopped coriander leaves and mix again. Take a slice of bread, spread the quinoa, sweet potato, mixture on the side without ghee, place sliced carrots and sliced cucumber on top of it. Add a generous pinch of chat masala on the carrot, cucumber slices. Now cover it with another slice of bread. The ghee-spread side should be on the outer side. 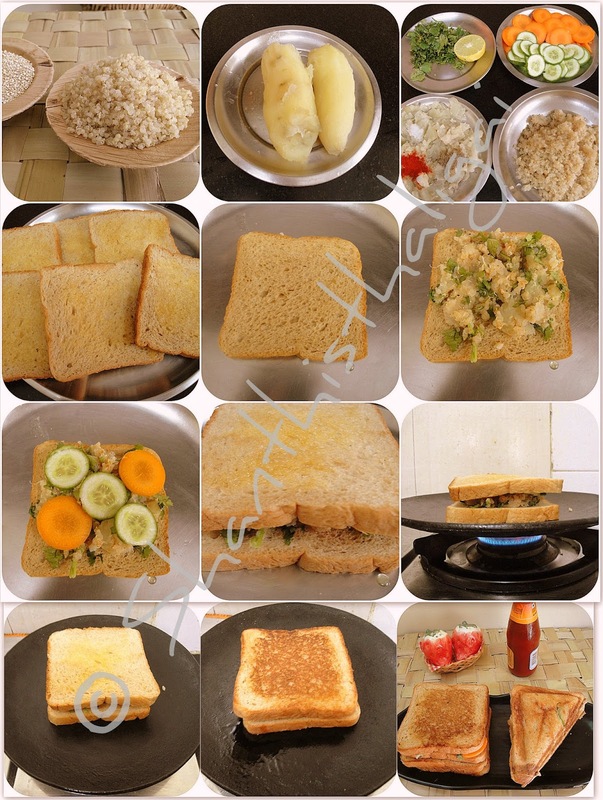 Toast these slices in a tawa on both sides until golden brown or in a sandwich toaster. Serve hot with tomato ketchup or tomato sauce.